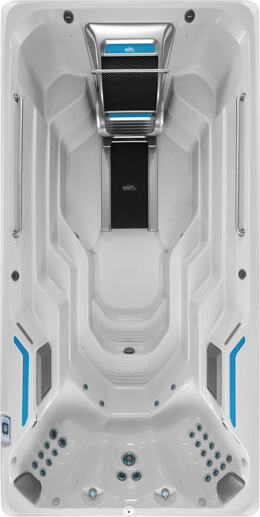 The E500, our 4.6m Fastlane Pools Fitness System, provides the ideal environment for at-home, total-body fitness. Featuring the signature Fastlane Pools Swim Current, the E500 gives you the best swim current on the market. Fully adjustable for every level – from Olympians to octogenarians – the smooth current lets you swim easily in place. The broad, deep current also adds resistance to a range f aquatic exercises for added core engagement. Our Underwater Treadmill (available on the 1.5m model) lets you walk, jog or run in water's low-impact environment. You'll burn just as many calories, but without the pounding of dry-land activity. It's ideal for anyone who has (or wants to avoid!) joint pain or overuse injuries. The durable, steel-framed cabinet has sleek, modern styling that's virtually maintenance-free, so the E500 brings both beauty and functionality to your home. With your choice of options – from a deeper model for chest-deep aquatic exercise to an Underwater Treadmill – you can truly make it your own. View Specifications. "The Fastlane Pool Swim Spa is a great strength builder. I am amazed at the strength of the current I now swim against. I did not buy it for that reason, but because of my arthritis, so the strength gain is a wonderful surprise." — Sara L.